Its trademark second spinning rotor is visible on the face of the watch in addition to the traditional automatic winding rotor mounted on the back of the movement. This watch design is inspired by aeronautical field & the front rotor portray a turbine - hence the name. 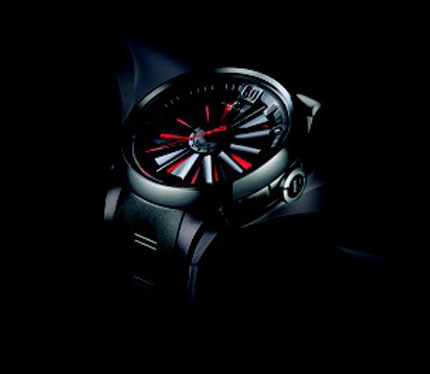 The Turbine rotor features 12 blackened blades above a black and red striped backdrop dial. The free spinning Turbine rotor makes for a sensational optical effect. • Case is blackened DLC (Diamond Like Carbon) treated steel which is highly Scratch-resistant. Polish bezel & satin finished case. • Hour & Minute hands filled with black luminescent material. • Red central seconds hand. • Inner fixed bezel ring with solid black Arabic Numeral & Index hours markers. • Crown recessed into case edge, with a small flip open lever to assist with winding & time change. • Perrelet caliber P-181, beats at 28,800 vph, contains 21 jewels & has an approximate power reserve of 40 hours.